The Blot Says...: Winter is Coming to Houston: Game of Thrones Star Emilia Clarke Headlines Comicpalooza 2019! Winter is Coming to Houston: Game of Thrones Star Emilia Clarke Headlines Comicpalooza 2019! Our friends at Comicpalooza dropped some huge news this week – Game of Thrones’ star Emilia Clarke is headlining Houston pop culture extravaganza this year! 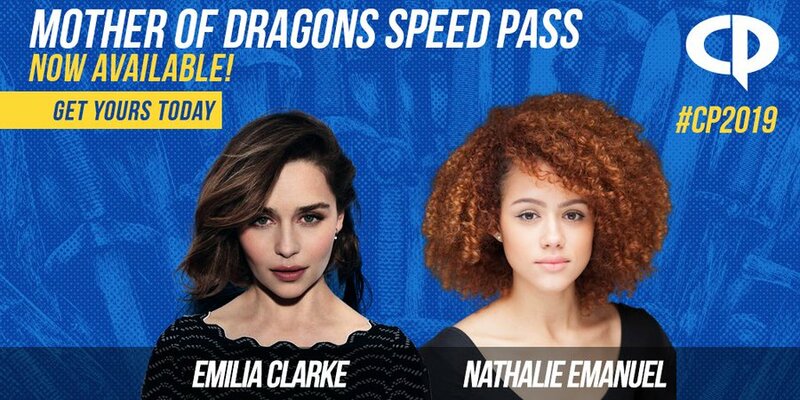 But that’s not all… The Mother of Dragons is being joined by the Queen’s personal Advisor Missandei, actress Nathalie Emanuel. Winter truly is coming to Houston this May thanks to Comicpalooza! Emilia Clarke has taken over the world of popular culture the past few years with roles such as Qi’ra in Solo: A Star Wars Story as Qi’ra and Sarah Connor in Terminator Genisys. But it’s her portrayal of Daenerys Targaryen in HBO’s Game of Thrones these past seven seasons that has made her such a fan favorite all around the globe. Both GoT stars will be at Comicpalooza on Saturday and Sunday only. Comicpalooza 2019 takes place May 10-12 at the George R Brown Convention Center in Houston, Texas. Weekend Passes and 1-Day Passes are currently available online at Comicpalooza.com. You can also pre-order autograph tickets and photo ops with these two amazing actresses, but you’d better act fast! Clarke’s individual autograph tickets for Saturday and Sunday are already sold out.